Embroidery | What did she do today? You never know, until you check the blog! 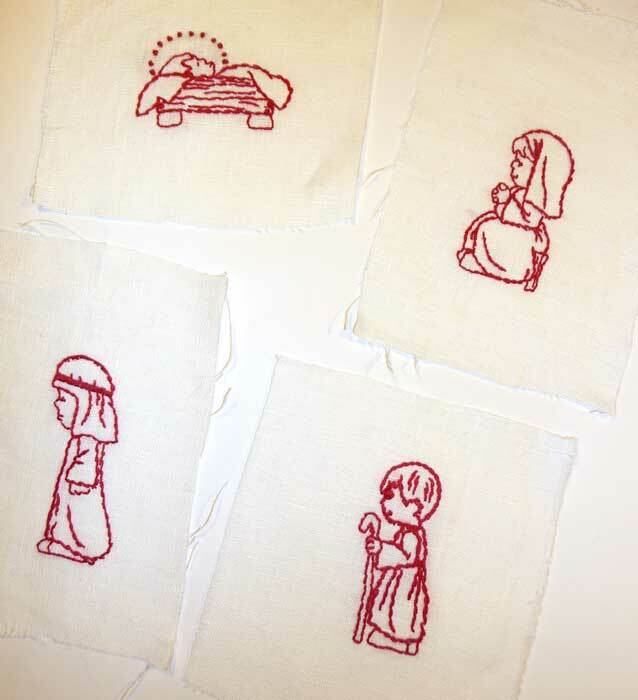 I’m working on the Advent project…26 embroidered ornaments. I decided that as long as I have the ornament done before the day we need it, I’m doing fine…which is good since I’m a bit behind on this project. In my defense, my husband came up with a much more involved list of images than I was originally thinking. Like he wanted Adam and Eve in the Garden…Hmmm….”Oh, and if you could have the snake that would be great”. 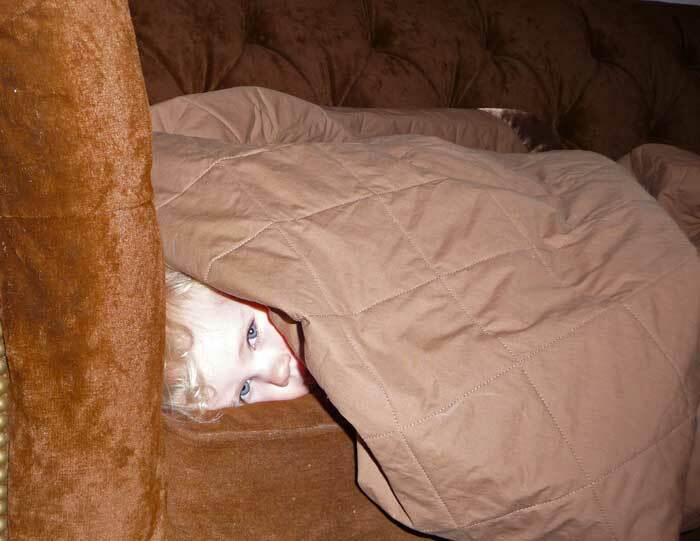 Sure honey…and this is how I get myself into such things…adorable isn’t it. I will give a list of the verses with the images as we go…maybe I’ll do one a day. That would be fun (and better than having any pressure to get them done early to show them all at once…hehehe). Tomorrow is Day 1. That one is done, as is day 3, 4, 5 and 6…Day 2 should be easy once I get to my parents copier to resize so I can transfer it. So my first week is well on it’s way. 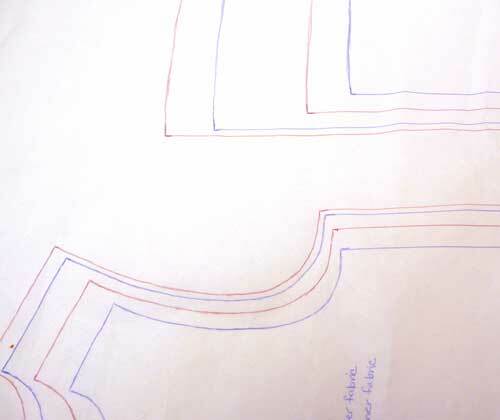 I also worked on drafting the pattern for the reversible wrap around dress, I have posted in my free tutorials section (on the right, over there). When the pattern is done, I am testing the sizes and tweaking right now, I’ll be selling it in my Etsy store. The sizing will be 6mos, 12mos, 2 years and 3 years. I’m excited to have a pattern for this, instead of just a basic instruction. I’m thinking it will be the first of the year before they are ready, but I’m happy to have started. I’m also working on ideas for packaging and overall presentation. 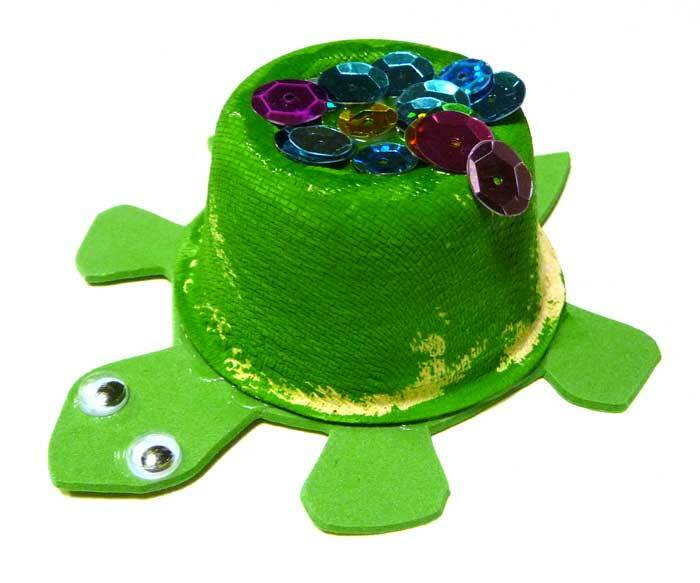 I like that sort of thing.n I have a couple more ideas that I’m working on in the area of children’s clothing. I’m not finding much in the way of cute, simple, practical, yet stylish patterns, in the catalogs of the fabric store. I also made a FABULOUS soup today. I’m a big fan of pea soup, and I’m not sure why I don’t make it more often…well, other than the fact that my husband, who is very agreeable to eating things he’s not fond of (he’s so great), really doesn’t like pea soup. Mini didn’t like it either. But I enjoyed it quite a bit. I got the recipe from the soup blog I mentioned a few days back. It uses sausage instead of ham…I had some Elk Sausage from the Farmers Market. When I make it again, I will use only a 1/2 pound of meat, as I like to have meat and the meat flavor in pea soup, but a whole pound made it much more prominent than meat needs to be in pea soup. Otherwise, I like the recipe. I did use leeks instead of spring onions, as that is what I had on hand. Isn’t Eleanor, the black chicken, just the cutest, chubby perfectly shaped chicken! I just love her and love to watch her. She also has a special place in my heart for being a hearty layer. She’s pulling her weight, with an egg a day most every day. 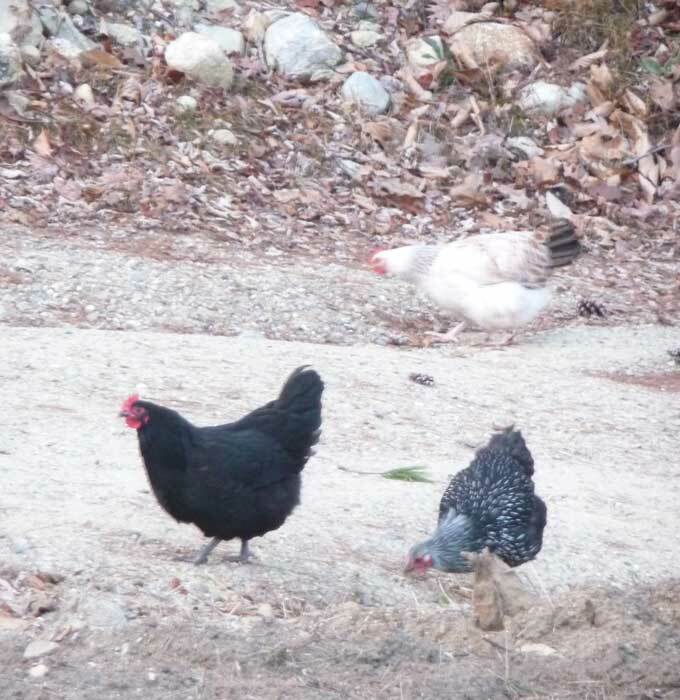 She’s a Black Australorp, and I’m thinking I may need a couple more of her breed this Spring when I order some Cuckoo Marans…the Cuckoos lay Chocolate brown eggs. I think that sounds like fun. When I was a kid mom made a felt advent calendar. I remember being so excited every morning, to come down stairs to put a new ornament on that tree…well, okay I was excited every other day when it was my turn to put the ornament on the tree, when it was my brother’s turn I was less enthusiastic about the whole thing, especially when I disapproved of where he decided to place his ornament…aaah the plight of the control freak older sister. But moving on the happy parts. I liked being involved in the countdown, and all the excitement that went with the holiday season. Now that I’m a parent I want to give that to my little girl. I also want her to understand the bigger meanings behind the traditions, and Christmas in general. I like the idea of the advent calendar, but didn’t want to do the standard thing that is out there right now. I like the idea of the advent wreath, but it’s not as interactive for the younger set, as a calendar. I poured over several different sites with readings and ideas for advent. I decided to be unconventional, and make up my own thing. I’ll chronicle here as I go along, in case anyone else is interested. 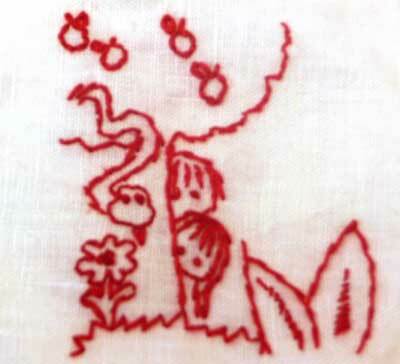 I have started with some embroidery which will become little ornaments of sorts. I found the images online. I’m going with redwork, partly because I love the look, being a big fan of red, and the simplicity. I also like the idea of the red for Christmas. These are the first 4 images, I need to still turn them into the ornaments, but I like how they are coming out. My responsibility is to do the physical part of the project, and hubby is going to sort through and decide what scriptures to include. I’m thinking this will evolve over time, but I’m excited about what we decided for this year. Mini is already excited about the embroidery, so hopefully she likes the whole plan when it’s done…which must be within 18 days, since our countdown begins on December 1! 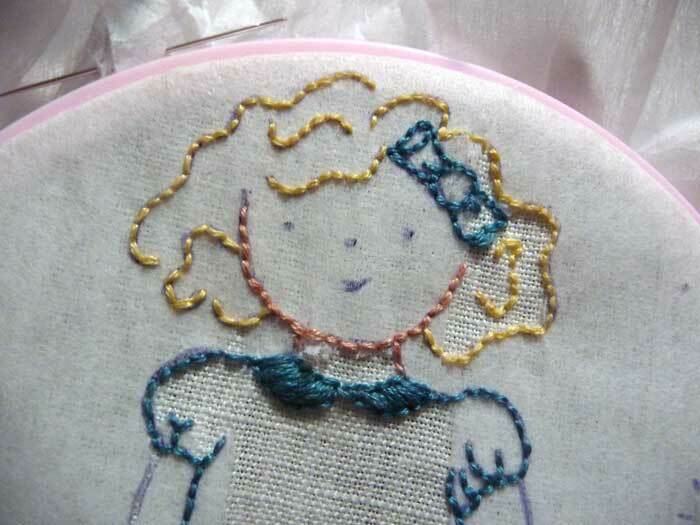 You may remember the little embroidered girl that I finished a few months ago. It was a pattern from Wee Wonderfuls. I have been wanting to use it to decorate a book bag for my little reader to carry her books to and from her daily library trips. Hubby brings Mini to the library nearly every day it’s open. She loves going and I’m all for encouraging her enthusiasm for books. I finally sat down to make, what is in my mind, a reality. Mini loves it! If you’d like to make one for your little one, I made up a tutorial! You of course don’t need to add an embroidered embellishment. You could also draw or paint one if you wanted, or omit that part all together. I can’t believe September is so far gone! It’s the 18th already. Well I spent the day feeling lousy, even napped, which didn’t help at all, and nothing has touched this headache. While I moaned on the couch, I did work on finishing up some projects that are a bit overdue. The Jack Frost Jacket should have been done last week, at least, but I shelved it for the gloriousness of new projects with new skeins of yarn, like those socks. 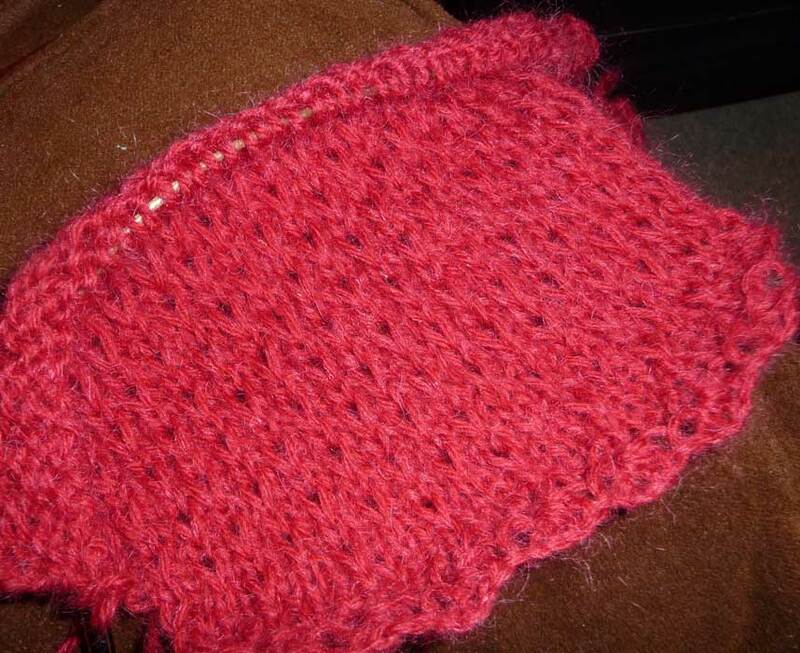 But today, I finished the last bit of knitting and have started stitching and weaving in ends. It desperately needs to be blocked when it’s done, but I have some more stitching, then some finish embroidery before I block it. I like how it’s coming out and I think Mini is going to love it. I also have a finished embroidery piece to share. One of the patterns from Wee Wonderfuls...sort of. 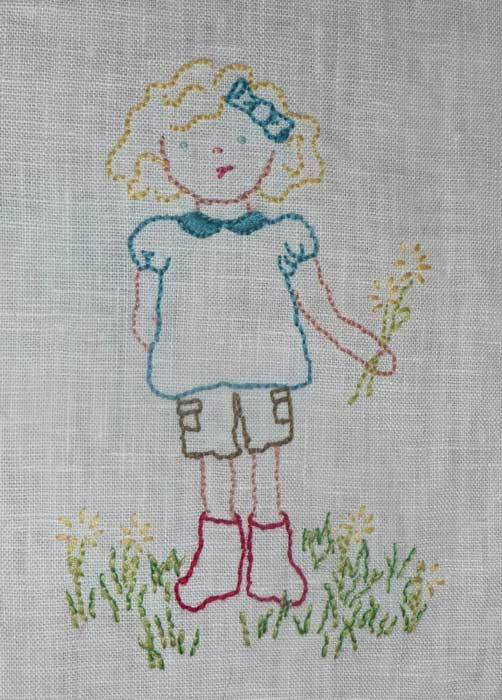 The head and body were not really together in the pattern pack, I switched them up a bit, added the flowers in her hand and the grass and flowers at her feet. It sort of reminds me of a little Mini out playing, and I plan on adding it to a library bag. I think it’s perfect for her, as she’s all about being outside and reading, so I figure this will be a great project to combine those interests. Mom purchased some lovely lampwork/glass flowers and leaves at the bead show in California and was at a loss as to how to assemble them into a wearable form. 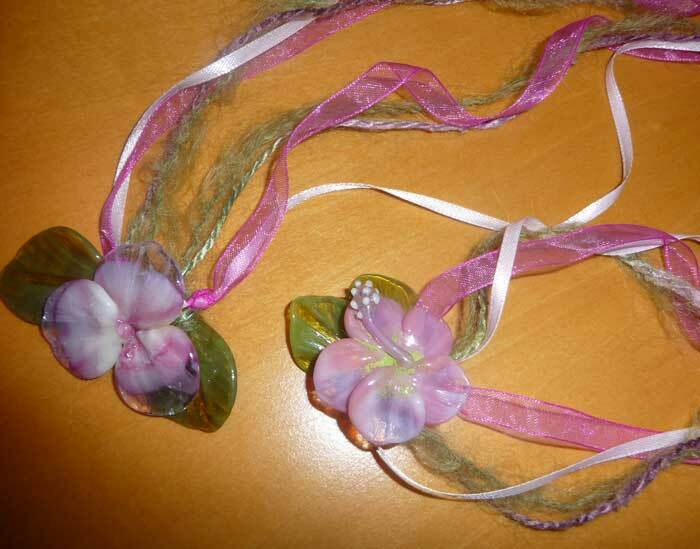 I made up 2 of the 3 that will be given as gifts, but need to get different ribbon for the third, as the color on that one is different than these two. I like how they came out, and more importantly, so does mom. The glass artist who did the flowers is Barbara Svetlick. She does gorgeous work. Very delicate. The shirt I cut out the other day, for Mini, is about 1/2 sewn. I lost enthusiasm when I hit the sleeves. I despise set in sleeves. I really don’t see that they add all that much in appearance and they add a lot more in futziness. I prefer a nice and easy raglan style. I must forge ahead, but decided it wasn’t going to be on a day I felt so lousy. So I abandoned it for more amiable projects. I have now stayed up long enough that I should be able to sleep again… I’m hoping that tomorrow is a more pleasant day. 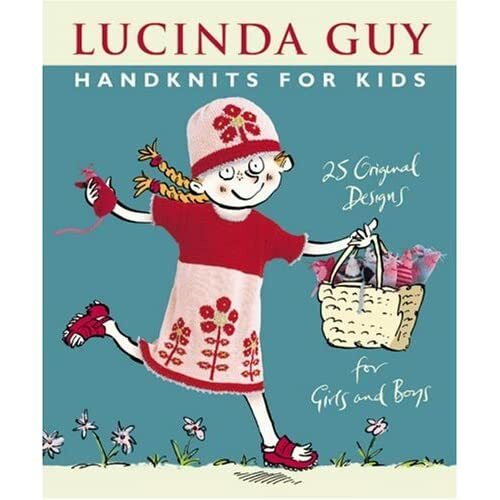 I loved this little jacket when I first flipped through the must have book by Lucinda Guy, Handknits for Kids: 25 Original Designs for Boys and Girls. It just looks so warm and cozy, and it’s made up in pink and red, which were a great combo. The pink in the pattern has since been discontinued, I’ve heard, but my LYS had a pink that I think will do rather nicely. I had a bear of a time getting started on this project. The stitch had me a bit befuddled and the gauge was slightly off. I checked in at Spinning Yarns, and am on the right track now. I’ve been working on the sleeves today. My grandmother gave me a tip, back when I first started knitting a couple years back, that when you make a sweater, use two balls of yarn and knit both sleeves at the same time. Her reason was to ensure that you do the same things at the same times, like decreasing and increasing and such, so that you know both sleeves will match each other, even if they are a smidge off from the pattern. So I’m making up both sleeves at once and I’m just a hair over half way through both of them. Here is a picture on the progress of one of them. I got a little sidetracked from my knitting by this adorable little embroidery piece I’m working on. I got the pattern on wee wonderfuls a while back. I started it on my trip and I’m doing a few stitches, here and there. I really like embroidery for that reason. You don’t have to figure out where you are in the pattern (unless you do cross stitch and folks who do that, and enjoy it, are far more patient that I will every dream of being…it drives me crazy), you don’t have to really think about the process much at all, you can just pick up your needle and stitch. I like that a lot. I have a long way to go to really learn the fancy stitches and make things that are amazing, and there is certainly an art to really impressive embroidery, but for a fun little side thing to pick up and put down at will, I find my embroidery level relaxing and fun! I’m not sure if I’ll turn this little girl into a rudimentary doll, or put her on something like a tote bag or something else for Mini. Somehow she will end up in the little one’s hands, I’m sure! Happy Independence Day! We went to a picnic, which was moderately fun. I got a pretty good sunburn, which was, and currently is, not fun. The other day I received a little package in the mail. 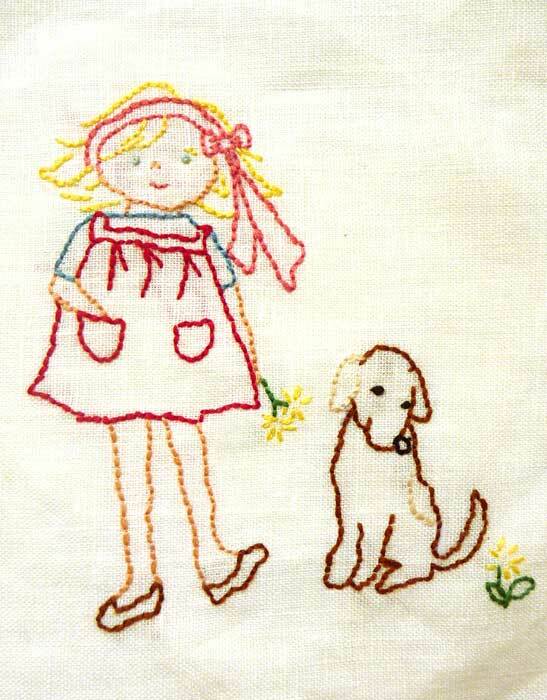 It was embroidery patterns from WeeWonderfuls. I’ve never really embroidered before. I’ve made attempts from time to time, but it’s never worked out. Well, from all my failed attempts, I’ve learned things along the way, and decided that the Summer 06 Stitchettes were simply too cute, and I had to try one more time. 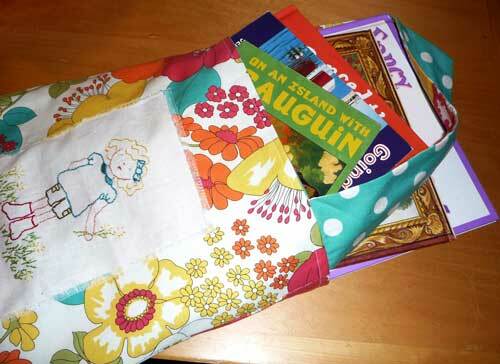 This time I had stabilizer and used Linen fabric. I divided the embroidery floss into 3 little strands, instead of the 6 they come in. This time things went relatively well. I added the dog from another pattern I that did not come from that site, but I thought it went well with this girl, so added it in. 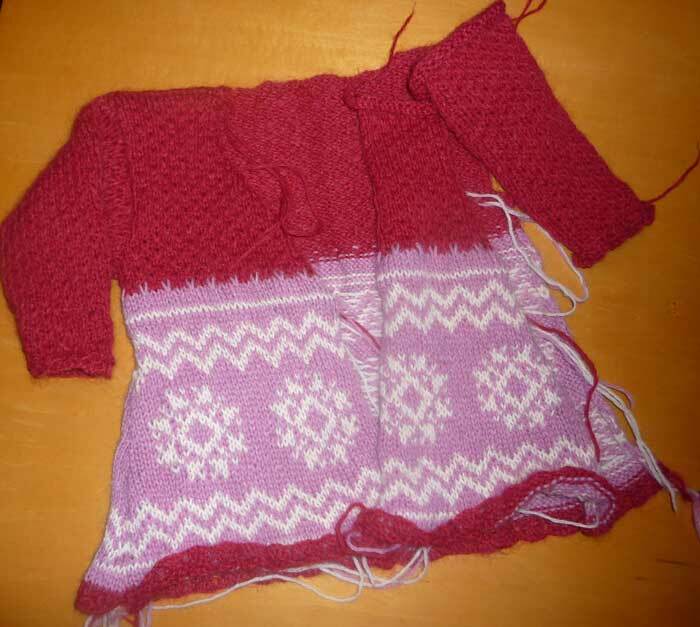 The sweater has half of one of the sleeves now!